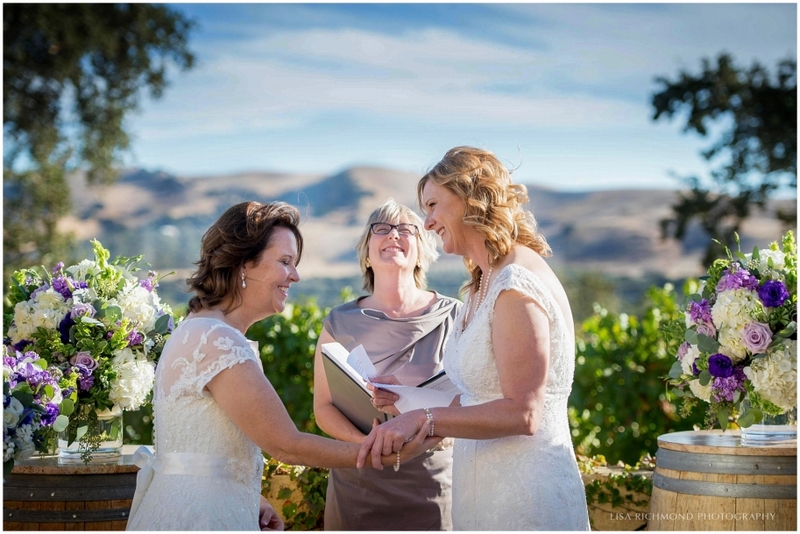 Linda and Kelly celebrated the lifelong commitment they made to each other over two decades ago at a beautiful wine country wedding filled with family and friends. From the outside, you might think they had just fallen in love! You can see their strong bond in every look and every move: the way Linda gazes at Kelly, emotion in her eyes and a shy hint of a smile…the way that Kelly clutches Linda’s hand in hers, bursting with excited energy and enthusiasm. There’s no question that these two were meant for each other. I first met Linda and Kelly at their engagement session last November. 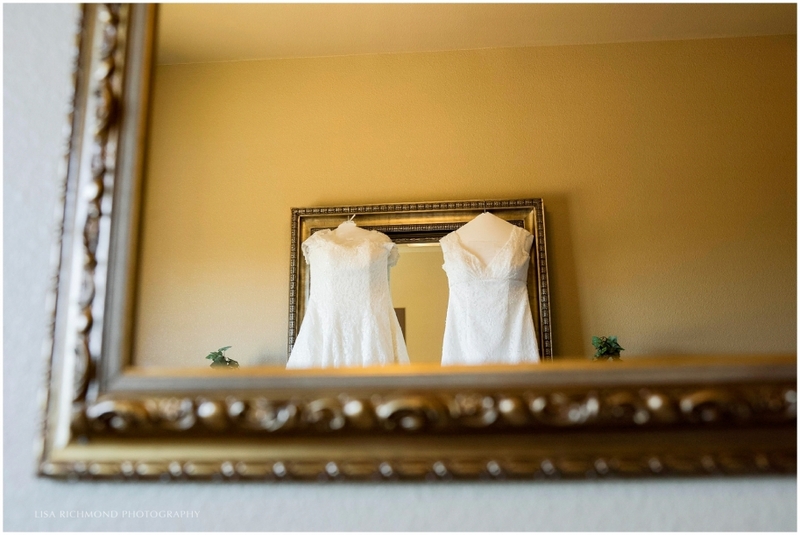 I had photographed the wedding of a mutual friends – Sallie Grace and Ashley, whom I have known since high school! It’s always the greatest compliment when a client recommends me to another couple. I couldn’t have been more excited to have the opportunity to work with Linda and Kelly. As an added bonus, Sallie Grace officiated the ceremony, while her wife Ashley sang an amazing aria. I don’t think there was a dry eye in the house after that. The brides chose lovely Las Positas Vineyards for their ceremony and reception – an elegant choice in the Livermore wine region. Each bride carried a gorgeous bouquet that was affixed with a memento of their fathers, which I felt was a beautiful way to honor them on this special day. Because they love to travel, Linda and Kelly decorated the tables in a multi-country motif, with each table representing a different exotic location. The DJ even played a song for each country as tables were excused to the dinner buffet! I especially enjoyed the fun tempo and joyful melodies of the Irish and African tunes. Although I’m eagerly anticipating a trip to Spain this October, I couldn’t help but get traveler’s envy thinking about all the amazing places these two ladies have been! Paris must be a favorite of theirs, however, as they treated their guests to a dessert buffet filled with macarons, petit fours, a croquembouche, and various other French delights. Oui, oui OUI! After dinner, Linda and Kelly were toasted with some of the sweetest, most heartfelt speeches that I have heard in a long time. Best friends, brothers, and goddaughters stood up and reminded us all why these two women deserve to share their lives together. It didn’t take long after the first dance for the dance floor to erupt into some serious partying! Surrounded by the love and energy of their tribe, these two women celebrated happiness in the best way possible. Tom Petty once sang that “the waiting is the hardest part.” For Linda and Kelly, the wait to declare their love legally and openly is over. Congratulations you two, I couldn’t be happier for the life you have built together, and look forward to hearing about where your future journeys take you!